Margot came to us alongside some of her classmates on Day 3 of our Parker, Arizona OneSight Clinic. She is 10 years old and in 5th grade. Her favorite subject is Physical Education and she loves technology because of how it helps her to learn new things. She enjoys drawing, especially animals, and dreams of becoming a doctor, nurse, or chef when she grows up. After seeing Dr. Simona, it was found that she had a strong farsighted prescription (OD +6.00 -0.75 142, and OS +7.00 -1.25 037). When reviewing the current glasses she came in wearing, we found that it was a +2.00 over the counter pair of reading glasses with one broken temple held together by a metal wire. If you know much about eyeglass prescriptions, you would know that what she is currently wearing daily is approximately 70% weaker than her true prescription. When asked if she has another pair of glasses at home, she said yes but she does not see nearly as well in them, meaning that they are likely an even weaker prescription. We were able to provide Margot with +4.50 readers, which is more than double the prescription she came in wearing. 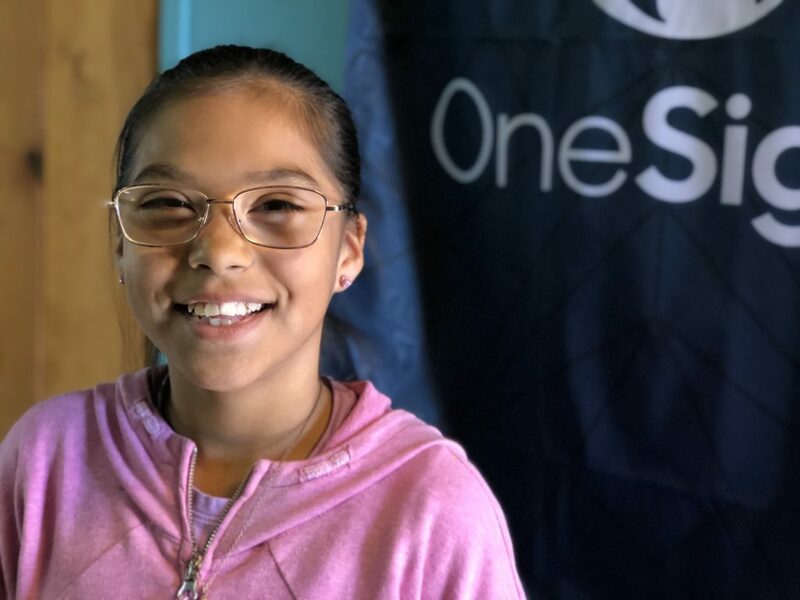 Her response was soft but clear, “Oh my God…WOW!” We explained to her that she would be receiving her true prescription glasses in the frames that she custom picked for herself once they were ready in just a few weeks. Her vision will be even more clear than what she got to see today, and she could not be more excited! 1 in 4 students in the US has an undiagnosed vision problem. Give a new pair of glasses to a student like Margot for as little as $10.